This entry was posted in Food, Recipes and tagged food, recipes, soup, spring, winter. Bookmark the permalink. This is my next meat free Monday dish! Mmmmm, this looks delicious! Definitely one for me to try in this freezing weather! It started snowing last night and I was wondering what I had on hand to make soup with ….and Bingo ! I’ve got everything but the sweetcorn . Off to make some for lunch ……. 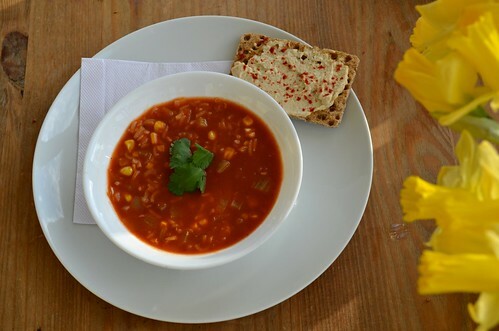 Your photos make this soup look very appealing – so warm and cosy! Just what we need right now! Love your blog, by the way. What an interesting soup! I adore smoked paprika! Hi Wendy. I just happened upon your gorgeous blog while noodling around looking for some inspiration this cold winter morning. 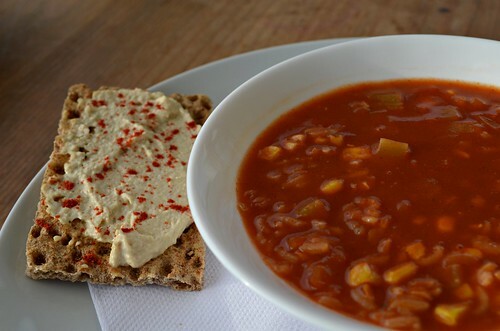 I do a similar soup with smoked paprika, and looking around I see a lot of similarity in our approach and ingredient choice. I am cancer health educator at the Maggie’s Cancer Caring Centres in Edinburgh and Fife, and my blog is an extension of my work, with mainly vegetarian family cooking. Great to find a fellow Scotland-based food blogger who is emphasising the healthy and delicious side of seasonal cooking. This looks delicious! going on my to-do-list! This looks like such a flavorful soup! And comforting too. Lately I’ve been enjoying all the blossoming plum trees in my neighborhood which makes me miss Japan. It gives me a little glimpse of spring as well! Can’t wait to try this recipe. Hope all is well with you, Wendy!